AIAA Houston Section in collaboration with the South Western Aerospace Professional Representatives Association (SWAPRA) invites you to a luncheon with a special speaker, Mr. Gene Kranz, Former NASA Flight Director. His talk, “Failure is Not an Option” will be at Bay Oaks Country Club on January 29th, 2014 at 11:30am and will discuss the Apollo 13 crisis, the stresses and challenges, and how it was all overcome. RSVP before Monday, January 27 to Chris Elkins at celkins@atec.com 281-276-2792 to make sure you have a seat at this special engagement. AIAA Members will also need to reserve their seat through PayPal unless also a part of SWAPRA. For those and further event details please see the event page. What Happened to the STS-107 Columbia Crew? Presentation topic: What happened to the STS-107 Columbia Crew? The AIAA Houston Section, in conjunction with the Experimental Aircraft Association’s Houston Chapter, will be attending this year’s Wings Over Houston airshow! The airshow will be held at Ellington Field on Saturday, October 27, 2012. Stop by the AIAA and EAA booths for EAA static aircraft displays and technology demos, as well as a great view of the airshow. No RSVP is required to stop by the booths, but airshow tickets must be purchased through http://wingsoverhouston.com/woh_tickets_mn.htm#generaladmission. 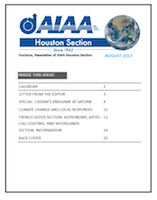 More information can be found at the official site, or by contacting the AIAA Houston Section (281-682-3653) or EAA Houston Chapter (281-467-2432). The EAA Houston Chapter’s website can be found at www.eaa12.org.